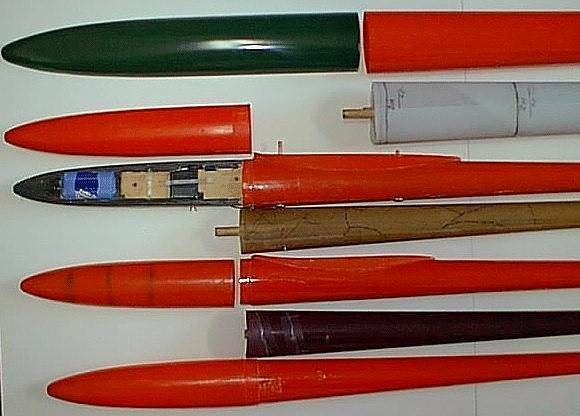 I have been using rolled glass fuselage booms since 1975. This method may be used for tail booms or in the case of my Prospector design the boom is continued forward to the wing leading edge. 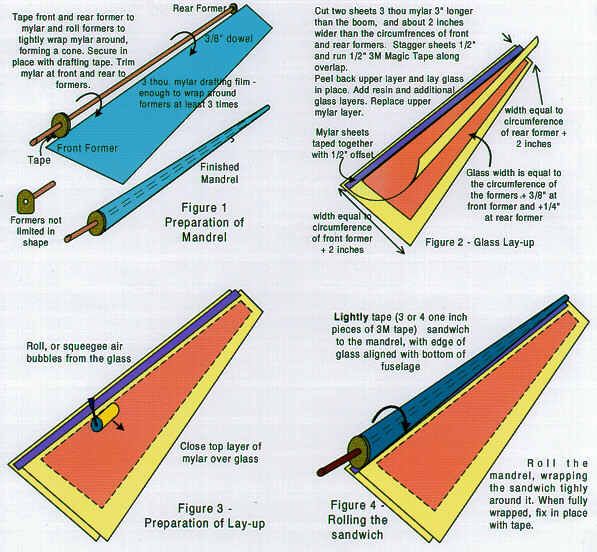 A sandwich of two layers of acetate film, with suitable glass layers in between is rolled around a tapered mylar mandrel, which has former at the front and a circular section at the tail. The following drawings should give an idea how the method works. On curing, the outer sandwich is slid off the mylar tube. The acetate layers are now both inside and outside the glass tube and have to be removed. The resulting glass boom has a single opening with a 3/8" overlap which is glued with CA. Instead of acetate film, mylar may be used, but I find the finish using acetate is far superior. This system has been used on everything from 1/2A pylon racers to 15 foot cross country Thermal soarers. This method is equally applicable to rolling 1/2" diam. ballast tubes. I have never seen anyone else use this method. The acetate I use is 3 thou clear in a 36" roll which was purchased from a drafting supply company. Regular drafting mylar works just as well, but is expensive to purchase. If you know anyone in the drafting game, I'm sure you can get off-cuts for free. 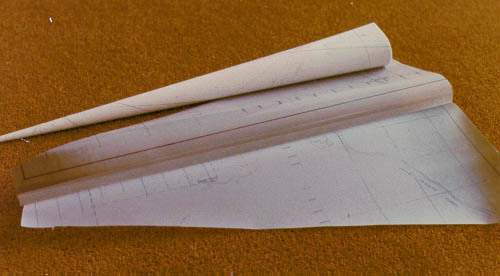 Even 6" wide strips will do a fuselage 1.75" diameter. Old discarded drawings will work too. The mat finish on the mylar will wash off wi acetone giving a clear glossy surface, but this is not really necessary if the fuselage is to be painted. The acetate sheet does not need any release wax is the resin will not adhere to it. Most of the mylar I have used will also separate without waxing, but occasionally I get some that will not release. Do some tests before using it. I normally use coloured pigment in the glass layup and the boom does not need painting except for a little touch up on the seam. The finish is usually better than I can achieve by painting anyway." The two on right are flat bottomed, rounded top FG mandrels from my earlier Spinifex versions. Just to show that the system works with different shape formers. Fuselage and mandrel of 2 metre Prospector. Note old geology map mylar. Wing bolts go through fuselage to blind nuts in wing.